If people want to do these crazy things let the carry on, it,s their choice. As a Dawlish resident, who knows several other Dawlish residents who regularly use the railway, enjoying the beautiful journey and caring passionately about its future remaining in its present location as much as possible, I am rather confused (or perhaps bemused) by the above post, but definitely will not lose any sleep, or use up any further energy over it!! The cost of building a new line at todays prices 8.1 million per km then take into consideration the terrain the cost would go through the roof. 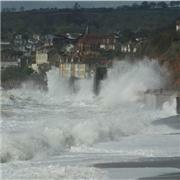 Then we would have a sea wall with little or no maintenance putting the town and cliffs at risk of flooding and erosion.